Portable, Shipping weight is 100 lbs for each loadbar. Loadbars are a great alternative to purchasing an extra large floor scale. 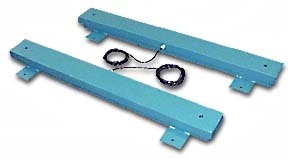 Simply set them as far apart as necessary, then lay the item to be weighed across the two Loadbars. Some customers prefer to lay a sheet of metal across the two loadbars, they then zero out the weight of the metal by pressing the ZERO button. 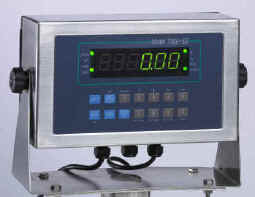 Each weight indicator has the following front panel keys: lb/kg, TARE, ZERO, PRINT, NET/GROSS. The T900-SS also has 0-9.